Spelling. Are you looking for deaminize, desalinate, Desalinized, or Destalinize? 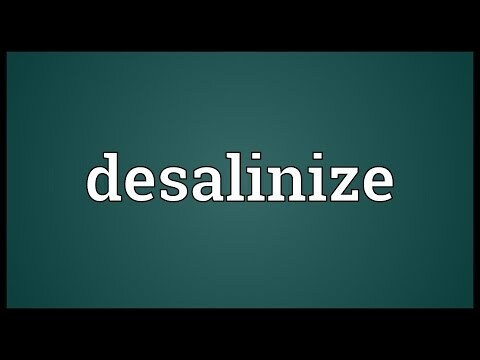 What does desalinize mean as a doing word? lexical domain: Change - verbs of size, temperature change, intensifying, etc. applied to permeable membranes to remove minerals from water; often used to desalinize salt or brackish water [EPA]; a process whereby ionized material passes through a membrane and the desalted organics and water are left behind . Ofien used to desalinize salty or brackish water (EPA-97/12). Electro dialysis: The separation of a substance from a solution through a membrane accomplished by the application of an electric potential across to the membrane (EPA-87/ 10a). The value of this 10-letter word is 20 points, but it's not an accepted word in the Official Scrabble Players Dictionary. Go to the thesaurus of desalinize to find many related words and phrases!